It's among the largest refuges of domestic animals in the world, but that doesn't mean Best Friends Animal Sanctuary is necessarily domesticated. Located just outside Kanab and surrounded by southwestern Utah's most iconic wilderness landscapes, the sanctuary makes it easy to enjoy red rock splendor and do some good for the animals at the same time. The landscape is, in fact, one of the primary reasons thousands of Best Friends' volunteers keep coming back year after year—nowhere is volunteering such an aesthetically pleasing experience, especially when walking one of the residents of Dogtown, the dog care center at Best Friends. As Phil Zabriskie writes about the sanctuary in the Asian edition of Time magazine, "Of all the miles I've walked in the spectacular landscape of the American Southwest, one of the most memorable was a stroll over a stretch of desert scrub with a scruffy, playful, sweet-as-can-be black-and-white dog named Harley." One of hundreds of sanctuary dogs up for adoption at Best Friends, Harley is always up for a hike. Though not within The Grand Staircase-Escalante National Monument, the 3700 acres that comprises Best Friends may as well be. The focal point of the sanctuary is Angel Canyon, carved through one of the step-like terraces that define the monument. Walls of caramel-colored cliffs line both sides of the canyon, leading in and out of steep side canyons that beckon exploration. From the rim of the canyon, an incredible vista of the monument's brawny White Cliffs encircling the sanctuary to the north is there for the gazing. If the scenery here appears faintly familiar, it's because you've probably seen it before—on the small and big screens. The "Lone Ranger" television series was shot in Angel Canyon, as were numerous scenes from "The Outlaw Josie Wales" and the Disney movie "One Little Indian." A barn built for the filming of "One Little Indian" still stands in one of the horse pastures along the canyon floor. Offering a break from desert heat, Kanab Creek runs a sinuous course through Angel Canyon, its banks dense with cottonwoods, cattails, willows, and birdlife. 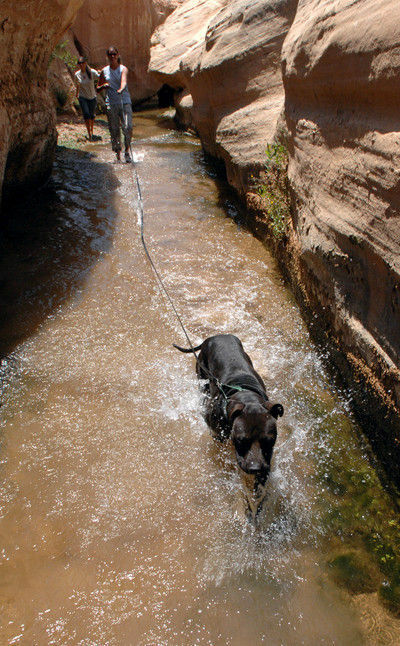 At one stretch, the creek channels through about 12 feet of sheer rock—a favored destination for dog outings. The short, but exhilarating Water Canyon hike from the Best Friends Welcome Center is one of the more thrilling ways to sample the canyon. 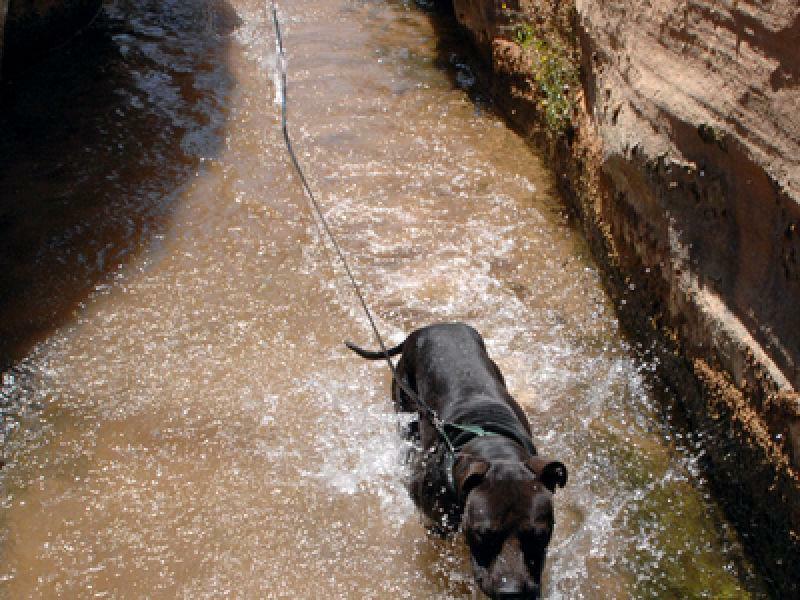 Along the way, you and your chosen canine(s) can dawdle in Kanab Creek and relish one of the few perennial streams in the area, sustaining a multitude of wildlife that live in or pass through the canyon. From there the trail traverses the side of Angel Canyon towards the cliffs before veering into a side canyon, where the ruins of an Anasazi kiva squats inside one of the many Angel Canyon alcoves. The trail climbs upward past spiraling rock formations and follows a spring before ending at a pour-off in the cliffs—where flash floods are often funneled into the canyon. From there, it's easy to roam along the slick rock to the east rim of Angel Canyon, where gorgeous vistas open up and down the canyon and out towards the White Cliffs. Water and time sculpted this magnificent landscape, and an easy jaunt into yet another side canyon reveals another way water behaves here. As snow has piled up over countless winters, water has seeped through the porous sandstone rock and dripped into a subterranean chasm known as the "underground lake." A short path lined with gamble oaks leads into a gaping hole at the bottom of a cliff, and the water inside is from snow that fell hundreds, perhaps thousands, of years ago. It's a refreshingly cool place to bring dogs on a warm day. The sanctuary lends itself nicely to exploration—that is, if you don't mind finding your own way around. Following deer trails, bushwhacking along the canyon bottom, or walking up and down the creek, you never know what you and your chosen dog may find. You may even stumble across an Anasazi petroglyph, pictograph, ruin, or spot a hawk's nest perched on a cliff ledge. Or you may run into a gaggle of wild turkeys that fly down each evening from the rim of Angel Canyon to roost in the cottonwoods. A good starting point, layover, or lunch spot for a hike through the canyon is Angels Landing, a natural amphitheater set within the cool, shady recesses of a domed-shape rock alcove. The acoustics are stellar here, making this an ideal setting for the occasional concert Best Friends hosts. And the lawn that's maintained here makes this an optimal place to romp with the dogs. Caregivers often bring dogs here to conduct some training, or simply to have a quiet moment away from the hubbub of Dogtown. Those who prefer a more structured way of experiencing the sanctuary while walking dogs can always tromp the trails around Dogtown. The trails meander across the desert floor through juniper trees, pinion pines, rabbit brush, Mormon tea, and sage brush. The dog-walking trails double as nature trails, flashing an array of native plants, blossoming from spring throughout the summer. From autumn to early spring, chances are good that you'll encounter deer along the way. And once you've seen Angel Canyon, there's a smorgasbord of other locations within a few hours to experience, including Zion National Park, Bryce Canyon, the north rim of the Grand Canyon and the huge Grand Staircase-Escalante National Monument. One of the closest destination hotspots to the sanctuary is Coral Pink Sand Dunes, a Utah State Park a mere fifteen minutes or so from Best Friends. Here, the waves of dunes, Technicolor in the morning or evening light, offer dogs a perfect place to romp and add their paw prints to the hundreds of wildlife tracks you'll find here on any given day. Whichever way you decide to experience Best Friends Animal Sanctuary or its environs, there's a canine companion or two at the sanctuary willing and waiting to experience the landscape with you. And there's no more gratifying way to do it. Editor's note: You can help. There are many ways animal lovers, vacationers and travelers to Utah can assist this wonderful and caring facility. Volunteering, adoption, donations and magazine subscriptions can all be found at bestfriends.org. The outdoor recreation and adventure opportunities in and around Kanab are seemingly endless. Zion National Park has some of the finest technical climbing and canyoneering routes found anywhere in the western United States. The dozens of hiking trails in Zion are world renown - from advanced slot canyons excursions through the Virgin River Narrows to Emerald Pools, a family-friendly leisurely stroll young kids and seniors will enjoy. Kanab is a gateway community to the Grand Staircase Escalante National Monument. Stark, mysterious, remote, rugged, secluded, mystifying are some of the many adjectives used to describe this amazing landscape. Nearly two million acres of pristine backcountry at its finest and destined to stay that way. Slot canyons by the hundreds. One is Buckskin Gulch, at 13 miles the longest continuous slot in the southwest. It is also one of the deepest with canyon walls climbing hundreds of feet above the floor. The Wave in Coyote Buttes, famed internationally, is nearby. Permits required, flash floods quite possible and carrying plenty of drinking water a must. Also in the neighborhood is the aptly named Paria Rimrock Toadstool Hoodoos hike. A camera will capture the memory. If you have always wanted to see the Grand Canyon, see it from the north rim. The one hour, 42 mile drive from Kanab up through the Kaibab Plateau's meadows and forests of dense ponderosa pine and mixed conifer leads to the brink of the spectacular north rim of the Grand, 1,000 feet higher than the south rim. Watch for the abundant wildlife and experience breathtaking views of the canyon. The Kiabab Plateau North Rim Parkway is not only a captivating drive for travelers but also an outstanding route for road bikers. If you're a skinny tire enthusiast looking for a leisurely ride through fir, pine, aspen forests, meadows graced with wildflowers and the awesome majesty of the Grand Canyon, cruise this byway to see why ESPN named it as one of the Top USA Biking routes.